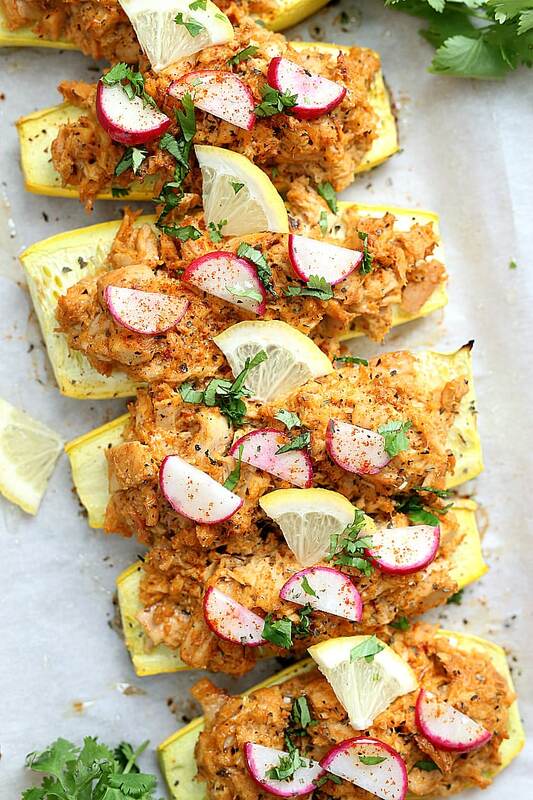 Tuna stuffed summer squash is a delicious low-carb meal. Use a zucchini or a yellow courgette as the boat and bake it stuffed with this lightened-up yet filling tuna salad. These squash boats are delicious and so simple to make simply baked on a sheetpan! 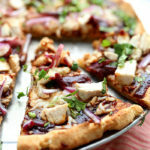 It is low-carb, gluten-free, high in protein and full of incredible health benefits. 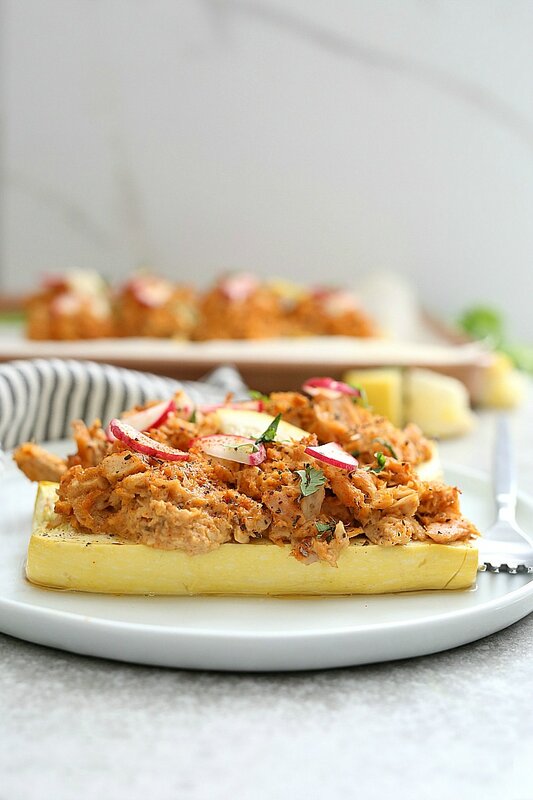 A ½ cup serving of raw summer squash provides 15% of the daily recommended amount of vitamin C.
We first enjoyed this tuna stuffed summer squash recipe the day we signed papers to purchase our new home! I prepped and baked it in the morning because I knew we wouldn’t be home till late. When we were finished signing it was quick to reheat making dinner in as little as 20 minutes! 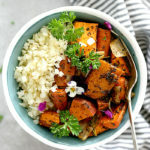 Last week I made it again and we all raved how delicious it is! 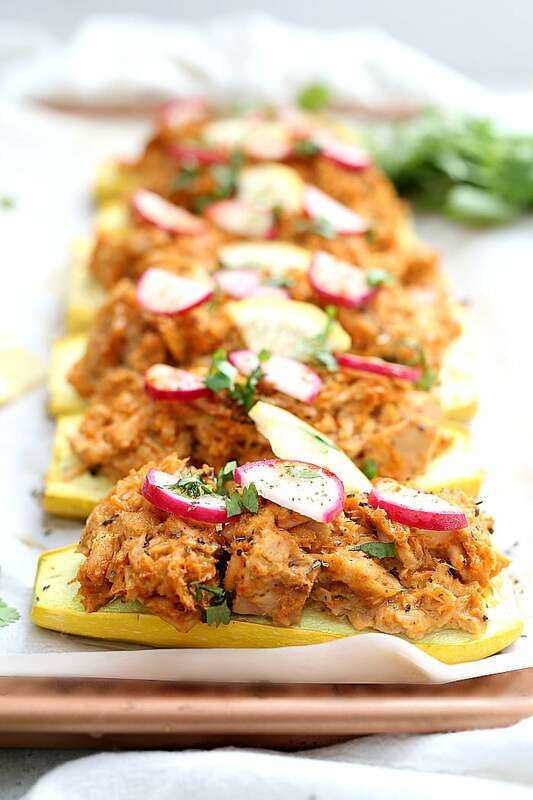 The combination of tuna fish mixed lightly with mayonnaise then baked on top of the yellow squash is pretty savory. 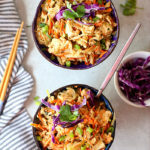 Just like my tuna casserole recipe but with out extra carbs?. Stuffed yellow summer squash (or zucchini) is great way to get almost half a day worth of vegetables into a meal. Can I use a different summer squash variety? Varieties of summer squash vary and may include yellow straightneck, yellow crookneck white scallop, cocozelle, patty pans and zucchini. For stuffing, I like to use yellow straightneck or zucchini for its even consistency in size all the way through. This allows for even baking. Summer squash boats take little effort to use – without much chopping, dicing and slicing! 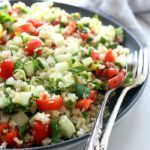 I have to say that alone makes this recipe one of my favorites since the prep work goes much faster than meals that require a lot of chopping. 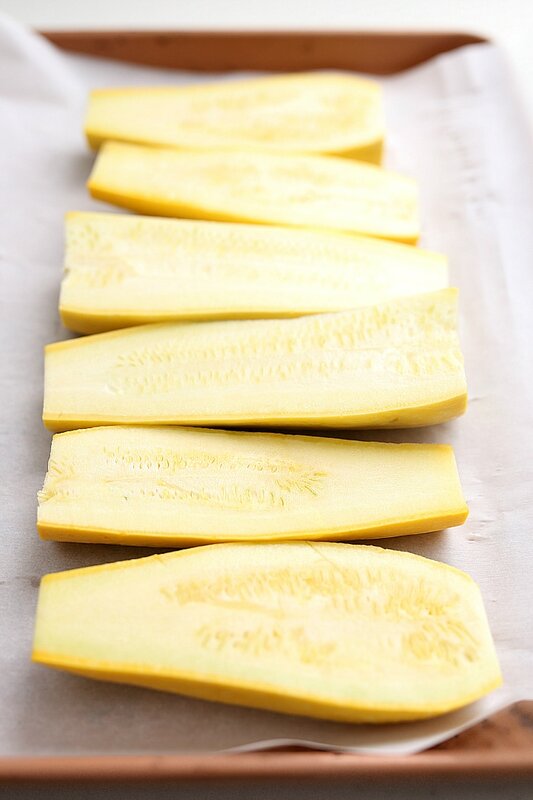 One of the best tips to baked summer squash is to add salt in the raw stage to release extra water. 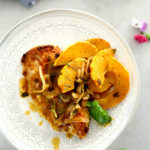 This is so that the squash does not turn out mushy. Nobody likes a mushy consistency in sautéed or baked courgettes. Slice off the ends of the yellow squash and cut in half horizontal. 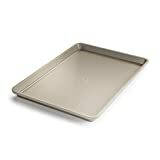 Slice off the bottom slightly so it lays on a baking pan flat without rolling around left to right. Sprinkle a generous amount of salt on top and let it set for 20 minutes. Then take a paper towel and dab it on top to absorb the liquid that is released. Thickness counts. I like my yellow and green zucchini squash boats to be thick. That is because I like to get as many vegetables in my diet as I can. My hubby on-the-other-had and children prefer their slices to be thinner so they taste more tuna rather than squash. It is about the ratio. Slice the bottom of the squash off to your desired taste. If you want more tuna flavor simply slice it to be about a ½ inch thick. If you like lots of squash just slice off the bottom enough to have a slight flat surface so it sits up on the baking pan (sorry it is repeat but I hope that makes sense). No you are all set! 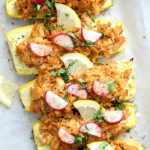 You can enjoy this tuna stuffed summer squash alone or served on lettuce in salad. It can also be made ahead of time and reheated at 350 degrees F for 20 minutes?. Enjoy! 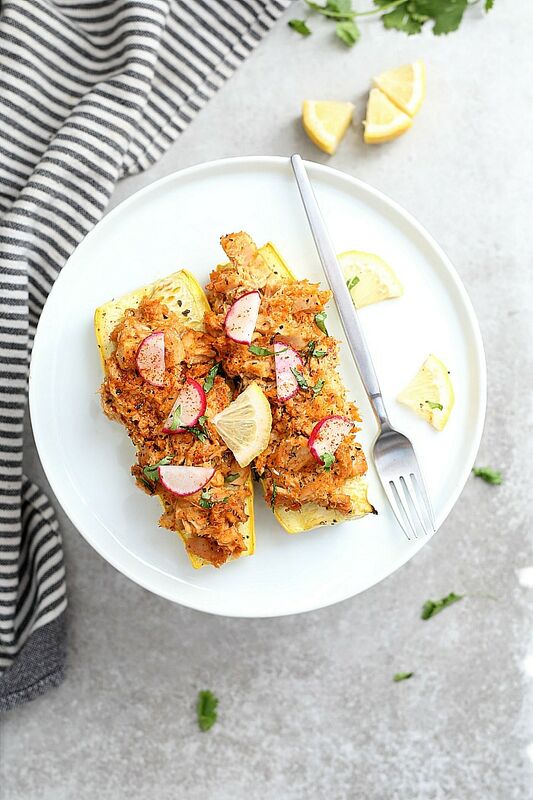 Tuna stuffed yellow summer squash is a delicious low-carb meal. Use a zucchini or a yellow courgette as the boat and bake it stuffed with this lightened-up yet filling tuna salad. Slice off the ends of the yellow squash (or zucchini) then cut them in half horizontally to total six halves. On the rounded side of each half, slice off a bit so it is flat when placed on a surface. Line in a row the prepared squash with the inside facing up. Sprinkle with salt and let it set for 20 minutes. After 20 minutes, using a paper towel dab the tops of the squash to remove the extra water that has surfaced. Bake for 20 minutes. While the squash is baking make the tuna salad. In a large bowl add the albacore tuna, Dijon mustard, mayonnaise, onion powder, paprika and cumin. Mix to combine. Divide the tuna salad into six servings. Place equally on top of each baked yellow squash or zucchini. Bake an additional 20 minutes. Serve warm and optional to garnish with radish slices, splash of lemon, cilantro and paprika for color. The yellow squash or zucchini can be cut into thin or thick slices. If you prefer more tuna ratio, cut into about ½ inch slices or keep them thicker for equal parts. You can also top these with grated cheese right before baking. Pin This Stuffed Summer Squash Recipe!